Welcome to Prestonville - we hope you will enjoy meeting our Cavaliers and Brussels Griffon situated in the deep south of New Zealand. Our Prestonville Kennels were established in 1973 with a blenheim Cavalier King Charles Spaniel called Peaches, followed by a red rough Griffon called Bengi. This introduced us to the addictive world of showing and judging. In the next pages you will meet our dogs, share a little of the development of our kennels and perhaps come to love Cavaliers and Griffons as much as we do. 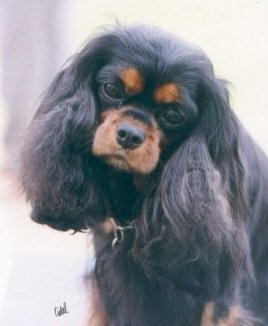 Pictured is a very special girl who epitomises the essential hallmarks of Cavalier expression for us. Her sire and dam were Multiple Best In Show winners at Specialties and Sade followed in their footsteps. Cherished by many for her quality and attitude she left an amazing legacy of wonderful wholecolours who are winning hearts today. This page is a tribute to her. Sade was loved and co-owned by Glenda Carter who always presented her to perfection.